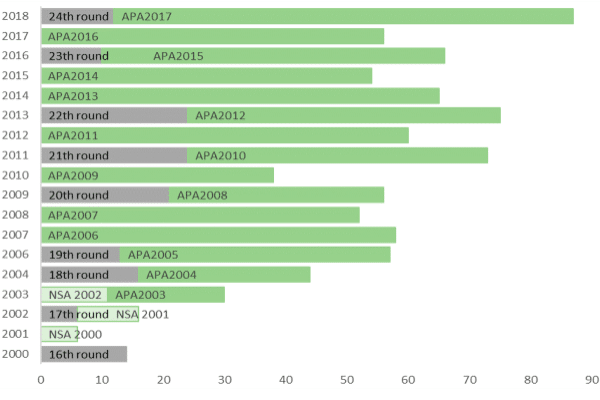 The previous record holder was APA2017 with 75 new awards. Of the 83 production licences awarded in APA2018, 37 are in the North Sea, 32 in the Norwegian Sea and 14 in the Barents Sea. Eighteen of the licences are additional acreage to existing production licences. The authorities have awarded acreage in the expanded APA area, both in the Barents Sea and the Norwegian Sea. “The number of awards show that companies believe that more resources remain to be found in areas with known geology and near existing infrastructure. It is important that these resources are discovered while we still have infrastructure such as platforms and pipelines nearby – then even small discoveries can be developed profitably” says exploration director Torgeir Stordal in the Norwegian Petroleum Directorate. The NPD points out that there is great diversity in the player landscape in this APA award, both small companies and large international companies are being offered exploration acreage. Of the 38 companies that applied (this number does not include Petoro), 33 are being offered ownership interests in at least one production licence. 21 companies have been offered operatorship. Equinor leads again the top with 29 awarded licenses (13 as operator), followed by Aker BP with 21 licenses (11 operatorship). DNO is on the rise and comes in as number 3 with 18 licenses (5 operatorships). When combined with the new awards of Faroe Petroleum (which was recently bought by DNO), it wins a total of 26 awards (9 operatorships). Link to the map over the awards.